On 9 August 2011 George Williams, an inmate at New York’s notorious Attica prison, was beaten so badly by a mob of huge white prison officers that he required surgical implantation of a plate and six pins in one of his broken legs. A shoulder, eye socket and ribs were also broken. The officers’ shirts were so soaked with Williams’ blood they made an inmate burn them, and they got another to mop the dayroom floor and walls that bore testimony to the brutality. The beating was carried out where other prisoners could see, and Williams’ pleas for his life could be heard on other floors. Given the extent of his injuries, the prison infirmary nurse insisted that Williams be taken to an outside hospital, which likely saved his life. Although now released and living back in New Jersey, he is in constant pain and still suffers trauma from the attack. On March 1, the eve of the scheduled trial of three of the sadistic prison officers, the New York Times published an in-depth exposé by The Marshall Project under the front-page headline, “A Brutal Beating Wakes Attica’s Ghosts.” This article shone a bright light on the institutional brutality and racist oppression at Attica. The next morning, the local District Attorney accepted a plea deal of misdemeanor misconduct. The felony charges of gang assault, conspiracy and evidence tampering evaporated. The thugs walked away with their pensions, case closed. Announcing the plea deal, the D.A. said: “Let me be clear: This has never been about jail for these officers.” Ain’t that the truth! Until this case, no New York State prison guard has ever been charged, let alone convicted, of a non-sexual attack on an inmate. The Correctional Officers and Police Benevolent Association hired some of western New York’s top criminal defense lawyers and was confident a jury from the area near the prison would not find against the thugs. The Times article quoted an inmate who had done over 20 years in Attica saying: “What they did? How they jumped that guy? That was normal.... It happens all the time.” For prison officers—a part of the repressive apparatus of the state that keeps the capitalist class in power—racist brutality is not a crime; it is their job. Attica is infamous for the 1971 massacre by state troopers and prison officers who retook the prison from insurgent inmates at the end of a four-day standoff. While the overcrowded prisons and brutal treatment the inmates were protesting sound very similar to the hellish conditions at Attica today, the social context was dramatically different. In 1971, there were intense social and political struggles taking place throughout society, from the “black power” movement to radical protests against U.S. imperialism’s war in Vietnam. The rebellion in Attica reflected these struggles inside the prison walls. Attica inmates were heavily black and Hispanic, and many identified with the Black Panther Party and the Puerto Rican Young Lords. Others were members of the Nation of Islam. In the early morning of September 9, the prisoners erupted, seizing most of the institution and taking 39 hostages. They proclaimed: “WE are MEN! We are not beasts and do not intend to be beaten or driven as such.... We have set forth demands that will bring closer to reality the demise of these prison institutions that serve no useful purpose to the People of America, but to those who would enslave and exploit the people of America.” The prisoners went on to demand the minimum wage for their labor, and an end to censorship and restrictions on political activity. They wanted a healthy diet, medical care and an end to segregation and punishment—i.e., some approximation of the minimum standards of life. For the capitalist ruling class, the Attica rebellion had to be crushed with particular vengeance because the rebels had begun to see their struggle in political terms, including aspirations toward revolution. The inmates demanded amnesty and transfer to a “non-imperialistic country”; instead they got a death sentence. Nelson Rockefeller, the liberal Republican governor, prepared the bloodbath. At 9:43 a.m. on September 13, a helicopter dropped CS gas over the yard, and 1,000 troopers and guards moved in for the kill. Prisoners were mowed down as they held their hands over their heads. Twenty-nine inmates and ten hostages were killed and many more injured, but the savagery of Rockefeller’s goons was only just starting. Hundreds of black prisoners were made to strip, lie face down and crawl in the mud. They were lined up and forced to run a gauntlet of crazed, sadistic guards. Such brutality was no surprise. In Uprising: Understanding Attica, Revolution, and the Incarceration State (2011), Clarence Jones wrote that it was known at the time that “a substantial number of Attica prison guards were also members of the local chapter of the Ku Klux Klan or its equivalent.” As editor of the black newspaper Amsterdam News, Jones served at the request of the Attica inmates as one of the observers during the rebellion. In the aftermath, 62 of the Attica Brothers were charged with a total of 1,300 crimes. Many charges were dropped after setbacks to the prosecution in the courts. Even an official report recognized that the police assault was “the bloodiest one-day encounter between Americans since the Civil War” except for the massacres of Native Americans in the late 19th century. Nevertheless, the real criminals of Attica—the racist authorities whose hands dripped with blood—were never even given a slap on the wrist. Rockefeller went on to serve a brief term as U.S. vice president. We honor the heroic martyrs of Attica for their courageous stand against overwhelming odds. It is for their fight for justice and against oppression that we want the world’s working people to remember them. Their demands for education and job training stood in stark contrast to the standard procedures of capitalist so-called justice: vindictive punishment designed to reduce the prisoner to a subhuman condition. The prisoners themselves refused to degrade the prison officer hostages as they themselves had been degraded. We observed at the time of the Attica rebellion that the “despicable racist guards are despised even by the ruling class that cynically uses them. The governor not only served notice on the prisoners that rebellion does not pay, and rebellion linked with revolutionary ideas means certain death, but he had a message for the guards too: Keep the upper hand or else!” (“Massacre at Attica,” WV No. 1, October 1971). The spectre of the rebellion continues to haunt the prison authorities, who use it to impress upon all new guards that their job is to keep the inmates in line, using all available means. Joseph Jazz Hayden, a former inmate who was transferred out of Attica seven days before the rebellion, wrote a letter that is posted on The Marshall Project’s website commenting on its recent exposé. He stated: “It is apparent to me that nothing has changed...[the guards] are little more than ‘Overseers’ on a slave plantation.” He continued, “Would things be different if the ‘Overseers’ were black? Nope!” Indeed, at the Rikers Island jail complex in New York City, the majority of the corrections officers are not white, but that does not change in the slightest their role as vicious overseers for the ruling class, delighting in the brutalization and humiliation of convicts and those awaiting trial (see “Rikers Island: Racist House of Horrors,” WV No. 1048, 13 June 2014). Today, the incarcerated population in the U.S. has mushroomed to some 2.4 million, seven times the number in 1971, not least as a result of the racist “war on drugs.” The prison population grew massively in the 1970s and 1980s in direct proportion to the sharp decline in unionized manufacturing jobs, a measure of how the bourgeoisie has deemed whole layers of the ghetto and barrio masses “surplus.” Prisons and jails represent, in concentrated form, the brutality of this racist capitalist society, with severe dehumanization and oppressive conditions directed against an already marginalized and demoralized population. As Marxists, we support ameliorating the hideous conditions in the prisons, as seen in our defense of the California prisoners who went on hunger strike in 2013 to demand an end to the Security Housing Unit system of solitary confinement. At the same time, we understand that the capitalist state’s prisons cannot be reformed into humane institutions. To lay the basis for abolishing the whole wretched system of crime and punishment requires a workers revolution to sweep away the bourgeois state and expropriate the class in whose interest the state is administered. 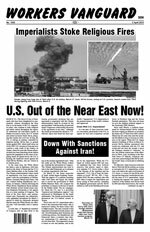 The rulers of U.S. imperialism, who in 1971 rained napalm and bombs on Vietnamese peasants fighting for revolution and CS gas and bullets on the Attica Brothers, today carry out incessant slaughter and torture abroad along with relentless state terror against the black population and attacks on the working class at home. It is the historic task of the working class to construct a socialist order where state torture and oppression will only be found in the pages of history books. The Spartacist League is determined to build a revolutionary proletarian party capable of leading the multiracial working class to power at the head of all the oppressed. U.S. Out of the Near East Now! Down With Sanctions Against Iran! Palestinian Activist Rasmea Odeh: Overturn Conviction! No Deportation! France: Down With Anti-Muslim Repression!